Nick Beasley teaches at Skyline High School's new Fab Lab. Anai Melendrez still remembers being only 7 years old when she first watched her father work. She said it was inspiring to see him deep in concentration as he fixed up ramshackle homes and buildings and cleared yards with dense, overgrown bushes and weeds. He transformed them into something beautiful and new. Over time, she started dreaming about following in her dad's footsteps, especially when she discovered that she had a natural talent for the work. By age 14, she was cleaning and clearing areas for him, hammering nails, cutting wood, and learning how to use the tools of the trade. But as much as she loved hands-on construction work, she didn't think she could make a decent living at it, especially seeing how hard her dad — a Mexican-American immigrant — worked and yet only earned modest wages. But all of that changed after she signed up for the Architecture Academy at Fremont High School in Oakland. When she took her first architecture, design, drafting, and construction classes, starting as a sophomore, it opened her eyes to the fact that she could pursue a career in construction — and if she joined a union-backed apprenticeship program and worked four years to be a journeyman, she could have a high-paying career, reaching into the six figures. "For so many immigrants, it can seem that construction is the only job they can get, and so people really take advantage of immigrants, not being able to speak the language, and so they aren't getting paid as much for the work they are really doing, and I saw that played out in my family," Melendrez said. "But when I got more knowledge on the wages and benefits of working in construction through an apprenticeship program, that's when I learned that I could actually make a good living out of this." Melendrez is one of the first of a new generation of Oakland high school students who are finding their calling in the lucrative construction and advanced manufacturing fields. After attending career fairs and series of pre-apprenticeship internships in the summers, offered by the Oakland Unified School District through partnerships with UCSF Benioff Children's Hospital, Turner Construction, and PG&E, Melendrez was exposed to different avenues in the skilled trades and learned the benefits of pursuing a career in construction work. She learned she could start directly out of high school in the trades as an apprentice making about $29.50 per hour, plus benefits, with pay increases of about $3 an hour every six months. And in four years, she could become a journeyman who earns about $52 per hour or about $104,000 a year. From then on, she would also have the option of moving up higher in the ranks, as a supervisor or project manager. That's why after being accepted to a number of four-year colleges, she decided to take an apprenticeship to become a carpenter, sponsored by Turner Construction and Tradeswomen Inc., after she graduated last June. Melendrez is the first direct-entry student into a skilled-trade apprenticeship from the Oakland school district in the last 20 to 30 years, said Emiliano Sanchez, Oakland Unified's director of Career Technical Education trades and apprenticeships. Sanchez has helped build up the skilled-trades career technical education program at the school district in the past three years. Last year, the program, with Sanchez's help, won a $500,000 grant from the California Community College Chancellor's Office's California Apprenticeship Initiative to build pre-apprenticeship programs at Skyline and Fremont high schools. The money allowed the district to invest about $200,000 to create a high-tech Skilled Trades Fab Lab at Skyline High. Opened last fall, the lab is outfitted for students to learn construction work with a saw top table saw, two chop saws, two drill presses, a grinder, a variety of power hand tools, as well as high-tech machinery, including two 3-D printers, a laser cutter, and a wood-engraving CNC router. 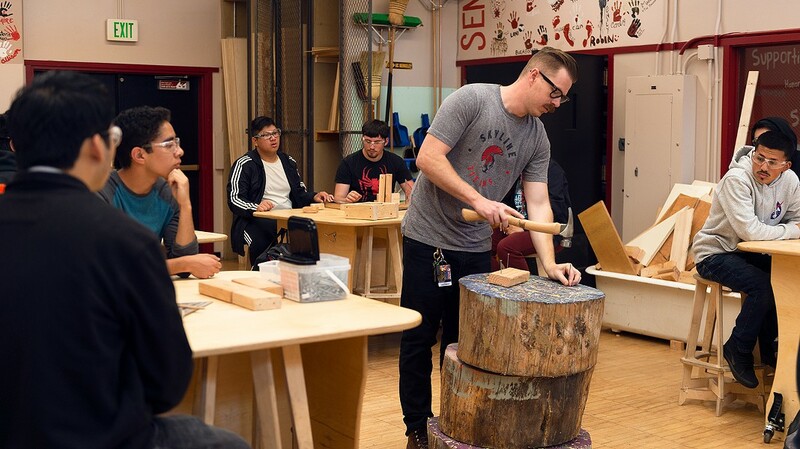 Fremont High, which has had one of the district's few construction labs as part of its long-standing Architecture Academy, also got an upgrade of about $125,000 through the grant. The rest of the money will be set aside for professional development for teachers and staff to help expose them to more offerings in the construction fields throughout the school district, Sanchez said. In the past couple of years, the Oakland school district has revitalized its vo-tech program, which is now referred to as its skilled-trades career technical education, or skilled trade CTE. The term "vo-tech" isn't used anymore in many education circles, because it carries too many negative connotations from the past, where old-school shop classes were predetermining which kids should go into blue-collar work for the rest of their lives. The re-envisioned program is giving Melendrez and other students the chance to learn more about how to become carpenters, construction workers, welders, machinists, electricians, pipe-fitters, concrete masons, and the like for the 21st century. OUSD's new skilled-trades programs also represent a stark turnaround from the college-for-all reforms that swept through the nation's public schools in the 1980s and '90s. The renewed emphasis on skilled-trades education recognizes that college isn't necessarily for all students and that tracking every student toward college, while well-intentioned, hasn't worked as designed. It's also a recognition that stereotypes and prejudices associated with blue-collar work have been counterproductive and that the district — like others throughout the nation — has failed to train young people for steady, good-paying jobs. The dearth of high school trades classes also has contributed to the current shortage of construction workers in the Bay Area and beyond.